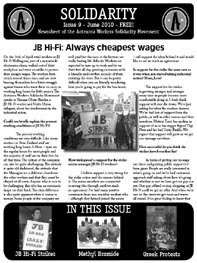 The ninth issue of Solidarity, free newssheet of the Aotearoa Workers Solidarity Movement. Download the .pdf below (1.3MB), or visit the AWSM website to read the contents online. Subscribers will be sent .pdf copies of Solidarity each month, along with other publications produced by AWSM and occasional information - we promise we won’t spam you with a ton of useless stuff though! The electronic copy is identical to the print version.